Douma gas attack: What is Trump likely to do? As Trump prepares what is a likely attack on Assad’s airfields, socialists should start by looking at the underlying issues. 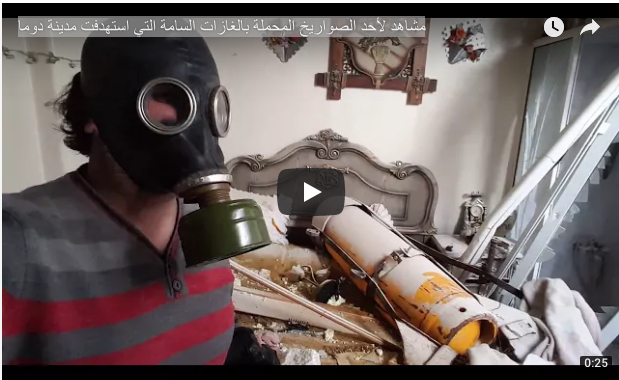 First: Was there really a poison gas attack on Douma on Saturday, March 7, and if so, was Assad the perpetrator? On the day after the attack, Assad said that such claims were a “hoax”, fabricated by the rebels who controlled Douma. In other words, that it never happened, or else that the rebels themselves were the perpetrators. Putin backed up this claim. 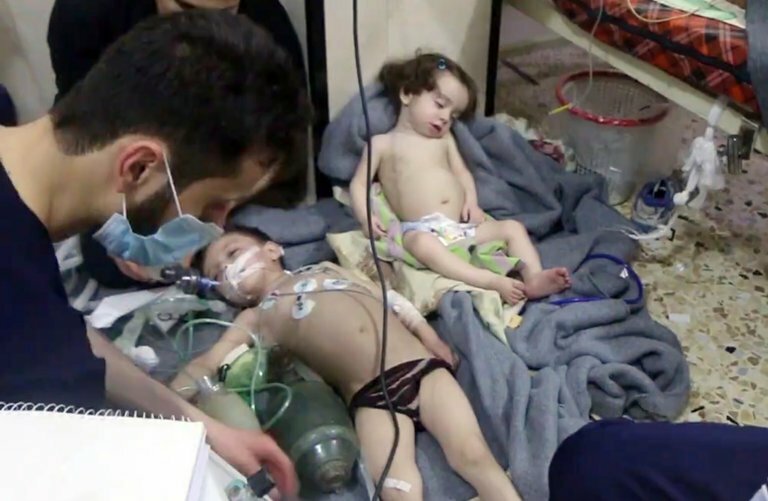 Report after report, photo and video after photo and video document that this chemical attack did, in fact, happen. Bellingcat.com, for example, has put together a number of such videos. 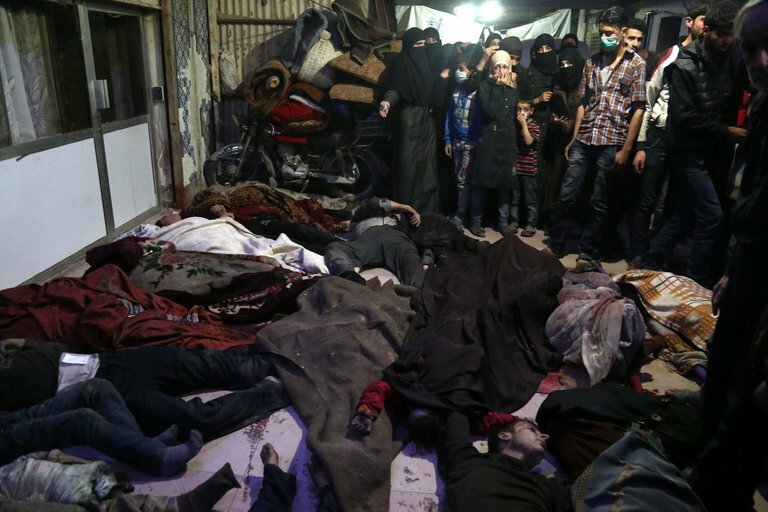 Victims of the latest chemical attack in Syria – this time in Douma. The Assad apologists would ask: “But Assad was winning. What would he stand to gain?” There has been news story after news story about how Assad is having tremendous difficulty holding on to his troops on the ground. If they had had to carry out a ground assault, there would have been a major loss of life and this crisis for Assad would have magnified several times over. The day after the attack, the rebels agreed to leave the area. Up until then they were holding out. That’s what he gained. The Assadists and their fellow-travelers claim that he was not guilty of the sarin gas attack on Khan Sheikhoun. Their latest alibi is the story cooked up by Seymour Hersh, who claims that it wasn’t even sarin gas in the first place, but a series of chemicals including phosphates released from a nearby storage facility. On the day after the Khan Sheikhoun attack, the Putin regime claimed that what happened was that the different components of sarin were being stored by Islamic terrorists and they were released by the bombing and combined in the air and that was what caused the sarin poisoning. All the Assadists and Putin supporters accepted this story. Then it was demonstrated that it’s almost impossible for sarin to be created in this way. Shortly after that, MIT professor Theodor Postol came up with the claim that the Islamists set off the sarin attack by a rocket they’d fired from the middle of the street. Despite the fact that this totally contradicted Putin’s claim, the same Assadists happily accepted this story. Then, when that was disproven, they accepted Hersh’s story, completely ignoring the fact that each of these claims totally contradicted the previous one. Hersh’s story was also disproven by Bellingcat. But who needs actual facts when you are determined to defend Assad from the beginning? And, through all of this, they all ignore the uncontested fact that Assad’s forces bombed the hospital where the surviving victims of the Khan Sheikhoun attack were being treated. So, this time he’s likely to do a little more. Maybe attack a few of Assad’s airfields. But Assad has already moved his fighter jets to Russian airfields, which will not be attacked. One thing is almost sure: Trump will not do anything to seriously cripple the Assad regime. After all, Trump has said again and again that the main enemy in Syria is the Islamic State and that “we” should be supporting Assad. And it’s most likely that, given the all-out attack on the real rebels, that the Islamic state that would benefit militarily if the Assad regime were weakened. “So, then, we should support Assad,” say many “socialists”, adding to the US capitalist choir. But, in the first place, it’s debatable which is more repressive – Assad or the Islamic State. And, more to the point, it’s the conditions created by the Assad regime with their foreign backers (including the US) that helped create Islamic fundamentalism in the first place. So, the real socialist position is to argue for international working class solidarity in deeds, not just words. For a direct appeal to the Turkish, Lebanese and Iranian working class to come together to join a new “Middle East Spring”! For the US to admit Syrian refugees!